My beach walks consist of parking the car, crossing over the dunes and heading straight for the water, and then walking along the shore for a couple of miles, turning around, and walking back. I almost wrote “retracing my steps” instead of “walking back,” but that would have been inaccurate. My steps seem to disappear almost as quickly as I make them in the ever shifting sand. Although I have been taking these walks nearly daily for more than half a year, I continue to be surprised by how much changes in the time it takes me to cover the same ground twice. Whether the tide is coming in or rolling out, whether the wind is blowing sand or not, whether the beach is crowded or nearly empty, change is constant along my route. In those early walking days I often made the mistake of procrastinating. If I saw something interesting to take a photo of, or investigate, or maybe a shell to pick up, I would hesitate and tell myself I’d do that on the way back. But I quickly learned that putting it off usually meant losing the opportunity. Maybe whatever it was washed out to sea before I returned. Maybe someone else picked up that shell. Maybe a gull carried something shiny away. Whatever the case, waiting until my second pass meant missing the moment. During a walk last week I started thinking how much this is and isn’t like the process of converting a first draft of a piece of writing into a second draft. Sometimes a second draft is such a considerable change from the first rough attempt that it is nearly unrecognizable. Shiny things and beautiful landscape from the rough draft are discarded or at the very least altered enough so as to appear new. Sometimes a second draft nearly obliterates the first one, taking the raw material and rearranging it as severely as a gust of wind or strong wave rearrange sand and sweep baubles away. The difference lies in who or what controls the change. With the coast, nature is absolutely in charge. Wind, waves, and rain sculpt the sand and deposit goodies on the shore. Yes, humans are part of that nature, but I am not directly in charge of the creation at large. I’m just an observer. When taking a second pass at a writing project, however, I am the creator. I decide what stays and what goes. I mold the raw materials into the shapes that I imagine. Even so, I sometimes find myself surprised by the differences of the second pass. Of course there are exceptions. On this morning’s walk I noticed a shell with friends attached to it at the water’s edge. I was only about half a mile into my walk, just hitting my stride, and decided not to stop to take a picture. I told myself I’d snap a pic on the way back if the shell was still there. 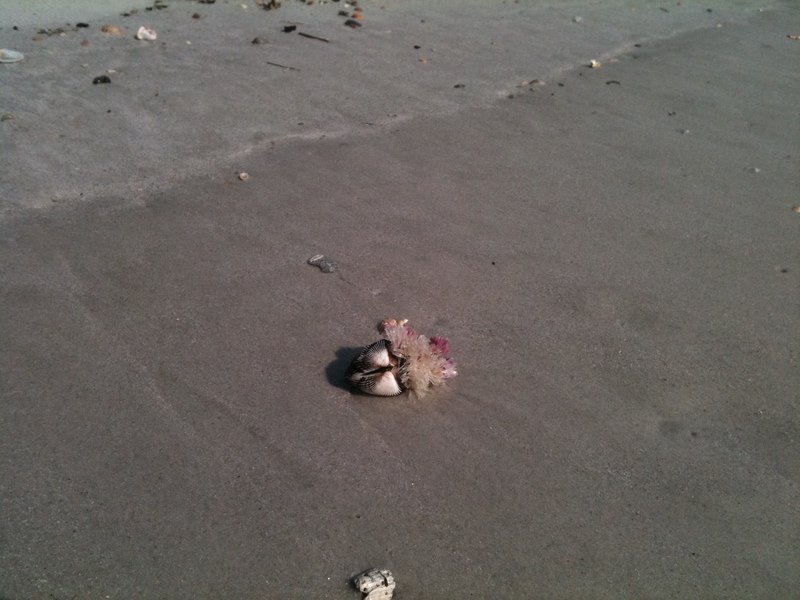 As I passed it a wave covered the shell and my feet and I figured the shell would be long gone when the water receded. Similarly, when I opened the file for the rough draft of this post, I found it already said most of what I was thinking. I just needed to add an ending. Today was one of those days when the second pass didn’t change that much after all.